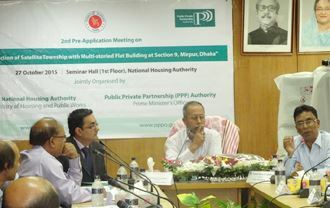 On Tuesday, 27th October, 2015, National Housing Authority (NHA) and Public Private Partnership Authority held 2nd Pre-application meeting for the project “Construction of Satellite Township with Multi-storied Flat Building at Section 9, Mirpur, Dhaka“. 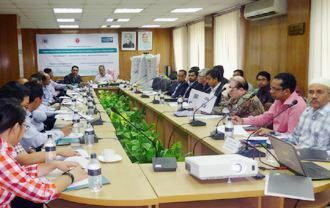 The meeting was held at Seminar Hall of Grihayan Bhavan, NHA, Dhaka and was attended by investors, corporate houses, developers, financial institutions and major Private sector developer of Bangladesh and overseas. Representatives from more than 16 firms participated in the Pre-application meeting. At the outset, Mr. Md. Sanwar Ali, Member (Engineering & Co-ordination), NHA, welcomed the participants and assured full co-operation and commitment of NHA towards the development of this project in the PPP format. Mr Syed Afsor H. Uddin, CEO of the PPP Authority provided a brief background of the project and described the purpose of the 2nd Pre-Application meeting in continuity with the 1st Pre-Application Meeting held in July 2015. Mr Nitin Kumar, Associate Vice President, M/s Ernst & Young LLP, the transaction advisor for the project delivered a presentation outlining various features of the project, project components, development potential, bidding process and also the format of bid parameter and contractual obligations related to the project. It was also pointed out that the details regarding the bid parameter and contractual obligations shall be outlined in more details during the RFP process. The key points related to the queries received during the First Pre-application meeting were also highlighted. The presentation was followed by an interactive Q&A session where all stakeholders discussed their queries about the project and the bidding process. It was requested that the participants would provide with written queries/clarifications and the Authority will address them accordingly. It was decided that the Queries/Clarifications related to the RFQ have to be submitted by 5th November 2015. The meeting ended with a note of thanks by Mr. Uddin.